When I first heard about Hampton Creek Foods' new vegan egg substitute, my first reaction was honestly a combination of "what the hell" and "ew." But in order to give this stuff a fair chance, I figured I'd try some myself (and try them out on the other editors) before jumping to the conclusion that there was no possible way plant-based egg powder could compare to the real thing. When I got my order of Beyond Eggs and realized the package stated that Beyond Eggs were "better" than real eggs, I became even more concerned. Because after all, that is a pretty bold statement for an impersonator to be making. However, the first signs of light came when I began to mix the cookie dough -- as the package explicitly states, Beyond Eggs is intended to be used to make cookies, and although others have apparently used it for other purposes, I decided to play their game on this one. And as I mixed up two batches of cookie dough, one with Beyond Eggs and one with real eggs, I can honestly say I couldn't tell much of a difference (see pictures below). But we're just talking about looks here, and this wouldn't have been the first time an impostor looked like the original, but tasted completely different. I admit, I still assumed that the taste test of the baked version would lean heavily in the direction of the real eggs -- I almost felt concerned that my co-workers were going to be angry that I fed them some weird fake cookie version of their favorite dessert. But the results of the blind taste test were almost unanimous: Almost everyone said that the two batches either tasted exactly the same, or that the Beyond Eggs version was slightly better. The general consensus was that the two cookies tasted "very, very similar," with one editor saying, "if I didn't know they were different, I would think they were exactly the same." The one major difference that almost all participants commented on was in texture -- the Beyond Eggs batch was "crunchier" and a bit "heartier," while the batch made with real eggs was "cakier," "fluffier" and "softer." But the participants made a point to emphasize that this textural discrepancy was not necessarily a bad thing, and that both were enjoyable textures with the same great cookie flavor and taste. Overall, it appears that this vegan egg substitute is generally a competent fraud -- and, according to many editors, even a bit better than real eggs. And unlike real eggs, Beyond Eggs have a longer shelf life, are less expensive than their battery-produced counterparts, and have added health benefits (in addition to the whole animal-cruelty-free thing). My own observations aligned exactly with those of my fellow editors: Both cookies were very, very good and very, very similar. Although I am not vegan, I would definitely eat the Beyond Eggs cookies. 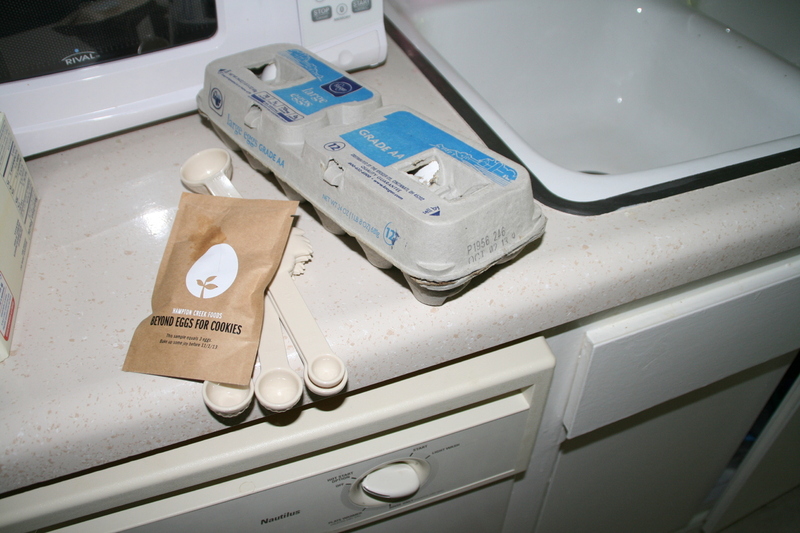 Check out the slideshow below for some pictures of Beyond Eggs and the cookie baking process. The Beyond Eggs and the regular eggs meet before their match-up.